There’s no doubt that mobile healthcare—often referred to as mHealth—has the ability to transform healthcare as we know it. Mobile health technology, such as mobile phones, patient monitoring devices, tablets, and other wireless devices allow physicians to make decisions quickly at the point of care. These devices are revolutionizing the way in which physicians diagnose, treat, and communicate with patients. This article provides an overview of mHealth use in the healthcare setting and addresses the benefits of mHealth for both physicians and patients. 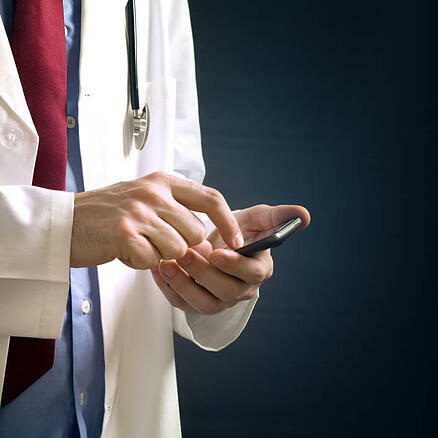 Eighty-four percent of physicians use a smartphone in their practices, according to a 2012 Google physician study that included a total of 506 physicians practicing in the United States. Fifty-four percent use a tablet, according to the study. When making clinical decisions, physicians spent twice as much time using online resources as compared to print. Other studies echo these findings, stating that physicians are increasingly likely to incorporate mobile technology into the patient visit. Forty-seven percent of physicians who own smartphones had shown patients images or videos on their devices, according to a survey by Manhattan Research titled Taking the Pulse® U.S. 2014. The survey, which included 3,000 physicians, also found that more than one third of participants recommended health apps to their patients. mHealth is a growing trend that has significant benefits for both physicians and patients. One of the benefits for physicians is that it provides them with information when and where they need it most—i.e., when they’re face-to-face with patients. RevenueXL's PrognoCIS EMR comes with a mobile application designed specifically for the iPhone®. It gives physicians and caretakers the flexibility to manage their practice from anywhere and at all times. The mobile EMR app allows physicians to manage their daily appointments; look into patient’s details - ailment history, lab results; communicate with staff through SMS/emails; and manage resources in real-time. Convenience. This includes rapid access to information as well as flexible communication with patients and other providers. Increased efficiency. Mobile devices and apps result in improved care coordination as well as enhanced data input, retrieval, and analysis. Enhanced productivity. When used at the point of care, mobile devices can streamline workflow, providing physicians with more time to spend with patients. Mobile devices also help physicians make clinical decisions with more accuracy, according to a 2010 study by PricewaterhouseCoopers’ Health Research Institute. The study found that one in three physicians tend make decisions based on incomplete information. Mobile technology helps fill this information gap, providing physicians with up-to-date resources in real-time. As physicians continue to search for ways to increase productivity in light of ICD-10 and EHR implementations, mobile health may be one solution. The continued influx of patients into the healthcare system as a result of the Affordable Care Act has also forced physicians to look to alternatives such as mobile health to change the way in which healthcare is delivered. Forty percent of physicians surveyed in the Health Research Institute survey said they could eliminate 11% to 30% of office visits through the use of mobile health technologies like remote monitoring, email, or text messaging with patients. This statistic could help offset physician shortages predicted for the next decade and beyond. Forty-one percent of consumers prefer more care via mobile technology, according to the 2010 Health Research Institute study. Fifty-six percent of patients like the idea of remote care. “The mobile revolution is everywhere around us,” Joseph Kvedar, MD, president of the Center for Connected Health (CCH), a unit of Partners Healthcare in Boston, told Medical Economics in an article titled A Physician’s Guide to Prescribing Mobile Health Apps. “It’s all about mobile now, and physicians can’t help but notice that, and they feel they have to get involved in some way,” he said. Mobile technology is particularly beneficial for patients with chronic diseases. Remote monitoring capabilities help reduce costs and increase positive outcomes for patients with congestive heart failure, pulmonary disease, diabetes, and skin ulcers. That’s because real-time monitoring identifies deteriorating conditions immediately, alerting physicians to the need for intervention. Health and fitness apps allow patients to track and trend their own goals. These apps also help inform patients about their own health conditions. This enhances the quality depth of conversations they’re able to have with physicians. A more informed patient is generally a more engaged patient. This engagement is important in an increasingly mobile computing environment. mHealth will continue to revolution the way in which physicians diagnose, treat, and communicate with patients. Physicians provide better and more efficient clinical care for patients when they incorporate these devices into their workflow. It’s in patients’ best interest to evaluate how this technology can be integrated into the practice.